This chapter discusses the inflammatory dermatoses affecting the dermis or both the epidermis and the dermis. 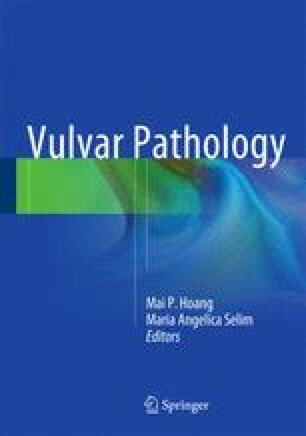 These diseases have been grouped by inflammatory patterns (lichenoid, granulomatous and vasculopathic); in addition, a comprehensive review of vulvar pain syndromes has been included. For each disease, a detailed description of the clinical and microscopic features, the best clues for differential diagnosis, and the up to date knowledge about its pathogenesis and prognosis are provided. Lichen planus, lichen sclerosus and Zoon vulvitis are included in the group of lesions with lichenoid pattern. The main clinical and histopathological differences between the first two are summarized in a table that constitutes a useful approach to this difficult differential diagnosis. Crohn disease, sarcoidosis and foreign body reaction are the granulomatous processes included in this chapter. A table summarizes and compares their characteristics including those of granulomatous infections, in order to facilitate their recognition and distinction. This chapter also provides the most relevant information about Behcet disease and aphthous ulcers, two entities with vasculopathic pattern that can closely resemble both clinically and microscopically, in spite of their major differences on systemic involvement, pathogenesis and prognosis.